Contact Dey Martin to order a custom built guitar or ukulele. Also find new and used guitars for sale here. Want to order a custom guitar? Contact Dey Martin for a consultation. Click here. Just finished! This new 100% handmade 00 / OM sized pre-war inspired smaller body steel string acoustic guitar named 'Arya' and built by Dey Martin has the wow factor. Its 150 years old Sinker redwood top packs a serious finger pickin' punch producing heavenly sound, perfectly intonated, with defined round solid bass and clear strong ringing trebs. I am certain that you will be very impressed with its balance of tone and lengthy sustain. The Look: You'll be awed at the look and feel. The top's chatoyance is subdued but noticeable. The abalone encircled unique vine motif rosette against this perfectly quartered master grade aged straight grain sinker redwood top is impressive. Fine straight-grain golden brown East Indian rosewood back and sides really complement the ruby red sinker top with back strip matching the vine motif of the rosette. 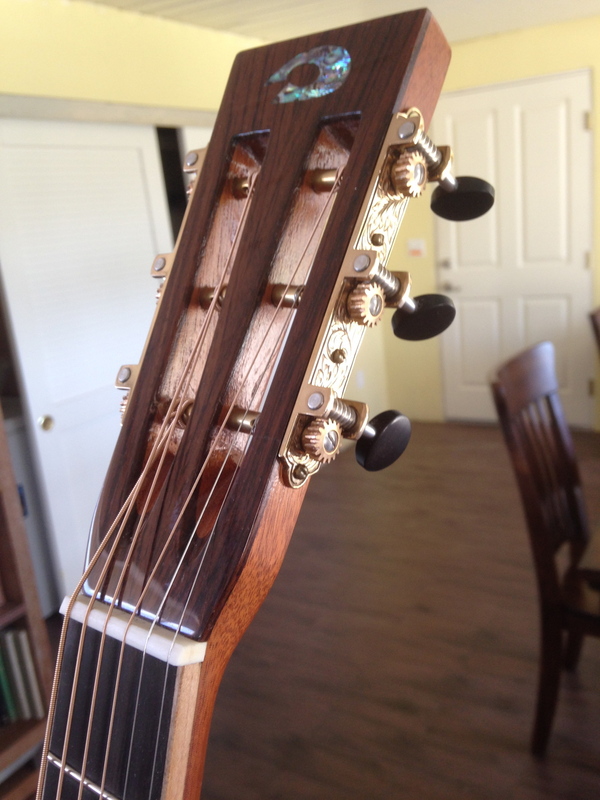 The neck is one-piece hand-shaped Honduran mahogany (by me) and I believe will fit perfectly in your hand. The action will be set just right to your specs. Buy it now and I'll ship it to you free in the guitar case of your choice. Get notified when new instruments become available. Get on my mailing list! Click here. 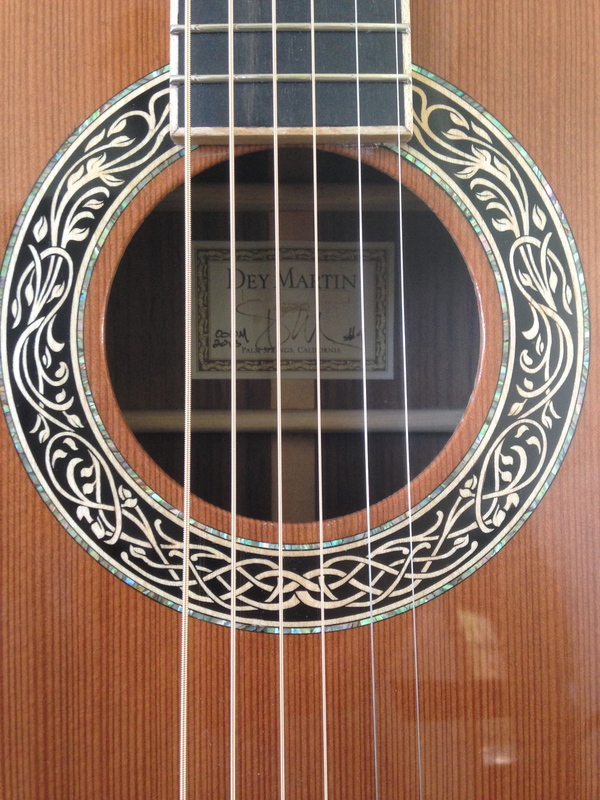 I am taking orders now for new custom steel string acoustic, classical guitars and 'ukulele. With my current workload, it takes me approximately three to four months to build a custom order guitar. To begin the order process, you should send me an email. We can telephone, Skype or Google Chat too. We will discuss your needs as a player and select tone and neck woods, neck shape, body style, appointments, tuners, finish, etc. down to the very last detail. We will discuss pricing and secure a time slot to start construction. Prices range from $4,500 - $9,000. The entry level base price for a handmade select all mahogany, spruce/mahogany, spruce/indian rosewood, or similar guitar is $4,500. Extras such as exotic tone woods, custom inlay, sound ports, cutaways, and electronics can add to the base price. I require $500 USD to book a slot and a 50% deposit to begin work. The balance plus shipping and insurance is due upon completion. My guitars come with a limited lifetime warranty. 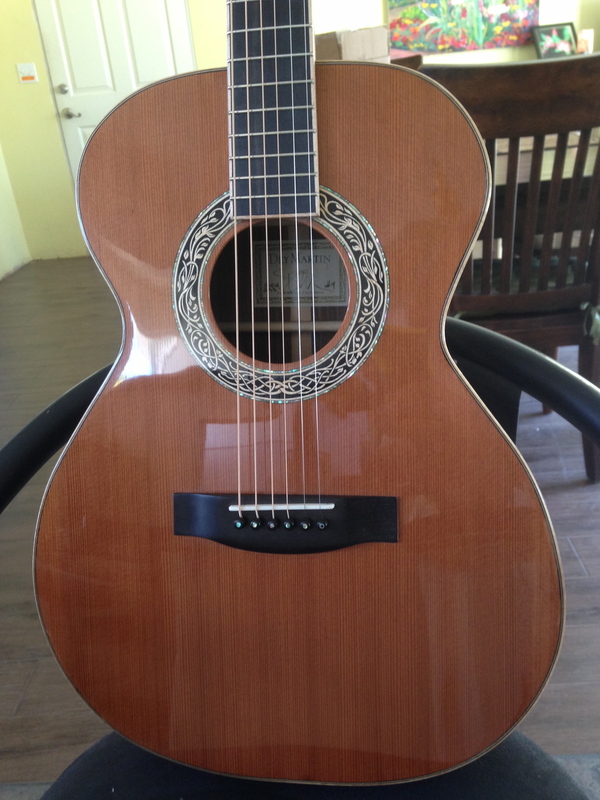 The price for a Dey Martin custom guitar similar to the 00-DM pictured below includes Ameritage Case is $7,500.00 USD. It is modeled after a pre-war Martin* having scalloped X-bracing top and the 00 size and body shape that is becoming so popular again today. 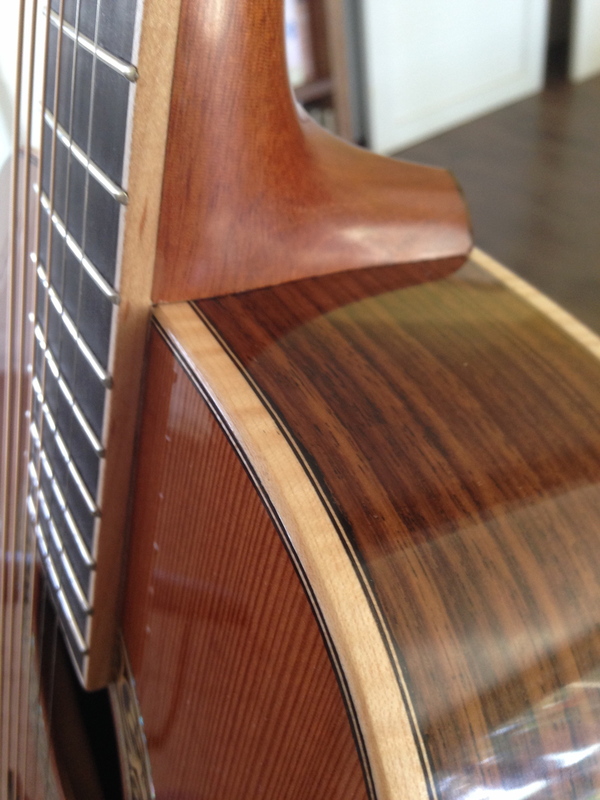 This guitar has a sinker redwood top, striped Macassar ebony back and sides, and a beautiful Honduran mahogany neck that was sourced from the paneling and bar of a demolished Irish Pub in La Jolla, California open since the 1980s. Waverly steel string style three-on-a-plate gold tuners for slotted peg head with ebony buttons, ebony finger board and bridge and a unique rosette with matching purfling and back strip make this a truly original piece. For more pictures of my guitars check out the guitar gallery here.